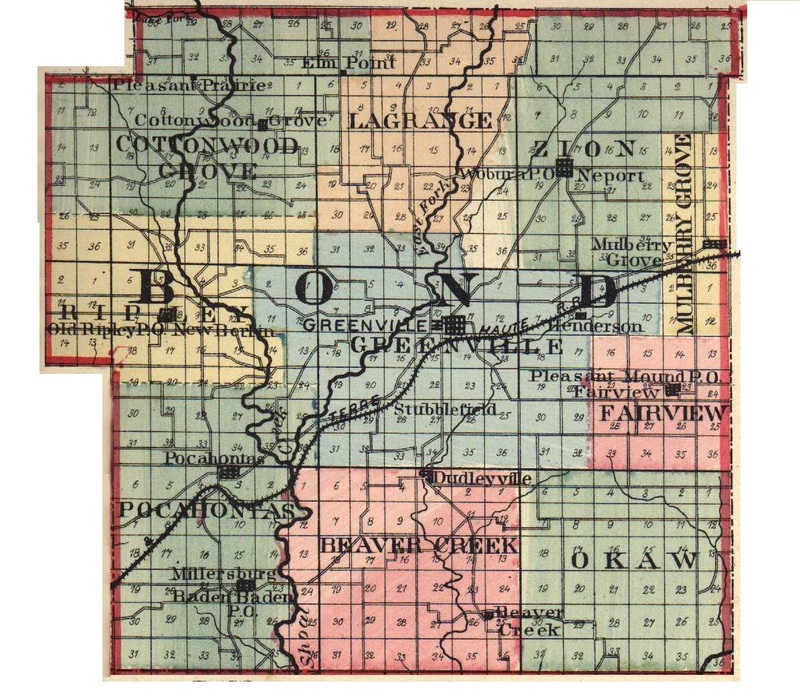 One of the successful business men of Bond county, who at the same time belongs to that typically American product, the self-made man, is Charles Henry File, a native son of the county. He is a man of varied interests, owning a large farm in Old Ripley township; conducting a, livery barn in Pocahontas; and being prominently identified with the development of the oil fields. Mr. File was born in Old Ripley township, January 24, 1872, the son of James F. File. The father was born near the same place in the year 1.848. He was reared amid rural surroundings and spent his life on a farm. Although only seventeen years of age at the outbreak of the Civil war, he ran away from home to join the army, but owing to his youth was brought back and his plans of leading a military life frustrated. Several of his brothers were in the Union army. James F. File was married at the age of nineteen years to an adopted daughter of Charles Pickern, Ella Pickern. Mrs. File was reared in Pocahontas and became the mother of six children, five of whom are living at the present time and C. H. being the eldest of the number. The father was a loyal Democrat in politics, and a member of the Methodist Episcopal church. He was identified in various ways with the many-sided life of the community. He died in 1901, in Serento, Illinois, where he was leading a retired life, the demise of his cherished and devoted wife occurring some years earlier. At a very early age the problem of making his own livelihood presented itself to Charles Henry File. At the age of nine years he began working at various occupations, and in the meantime attended the public schools, during the most of his educational period working for his board. He was the eldest in a family of very modest resources and as there is no arguing with necessity he was soon forced to that self-support which gave him the self-reliance which has been one of the greatest factors in his success. He has divided his time in late years between Pocahontas and Old Ripley township, in the latter neighborhood owning an excellent farm, which he has brought to a high state of cultivation. In Pocahontas he conducts a well-patronized livery barn and this as well as his agricultural work is successful. He was also interested in a creamery in Old Ripley. He is a director in the Pocahontas Oil Company and is deeply interested in the development of the oil resources of this section. He is, indeed, a substantial and progressive citizen. Mr. File was married November 4, 1907, the young woman to become his wife being Rosana Boyer, of Old Ripley township, daughter of John Boyer, a prominent farmer. Mr. File's father-in-law was a lieutenant in the Union army at the time of the Civil war, and was one of five brothers who served during the great conflict between the states, all being aligned with the cause of the preservation of the integrity of the Union. Mr. and Mrs. File maintain a hospitable home and possess a wide circle of friends. Mr. File belongs to the Independent Order of Odd Fellows, of which order he has been a member since his twenty-first year and in whose affairs he takes an enthusiastic and whole-hearted interest. Extracted 10 Nov 2018 by Norma Hass from 1912 History of Southern Illinois, by George W. Smith, volume 3, pages 1490-1491.